Attendance helper Patrick Knapp is counting his classmates at Wee Explorers Preschool in Morrisville. The parent cooperative school is now entirely run on public tuition dollars. At the beginning of this school year, every preschool aged child in Vermont was able to attend publicly funded pre-kindergarten. It's the first year Universal Pre-K has been fully implemented across the state. Gail Beck is the director and head teacher at Wee Explorers Preschool, in Morrisville. She says preschool teaches skills students need to help them succeed in kindergarten and beyond. "Preschool is an opportunity for growth for all children," says Beck. "And it really provides an opportunity for children to learn, to share, to be creative problem solvers, creative thinkers – and basically just lay the foundation for learning that’s going to occur in elementary school." Wee Explorers is a parent cooperative that’s been around nearly 45 years. And in recent years, the coop has worked with public schools in Lamoille County to provide publicly funded preschool for local students – first under Act 62, and now under Act 166. Under Act 166, the state pays a set tuition to schools such as Wee Explorers to provide 10 hours of preschool a week, for the 35-week school year. This year the tuition is just under $3,100 per student. In total, the state is spending about $13.7 million on Pre-K tuition this year. That accounts for payments made to private preschools as well as payments to public preschools for out-of-district students who attend a preschool program run by a school district. All of Vermont’s 3-, 4- and 5-year-olds who are not attending kindergarten are eligible to participate in Universal Pre-K, but it’s not required. 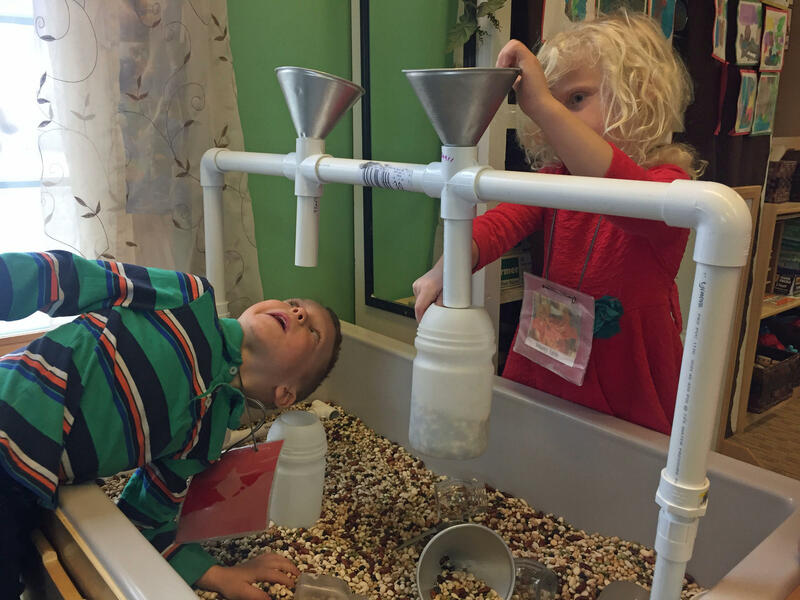 Leo Peterson, left, and Brienna Davis explore the bean sensory table. Basically, it works like a voucher program for preschool. Families can choose to send their child to pre-K at their local public school, if it’s offered. Or they can pick a private program that is “pre-qualified” or, in other words, endorsed by the state. Tierney O’Mara is the Universal Pre-K coordinator for the Agency of Education. She says the state pre-qualifies private centers, co-ops and home-based programs, but they all have to meet the same standards. "In order for a program to become prequalified, there are specific quality standards that program has to meet," she explains. "And one of them is having a licensed early childhood educator." 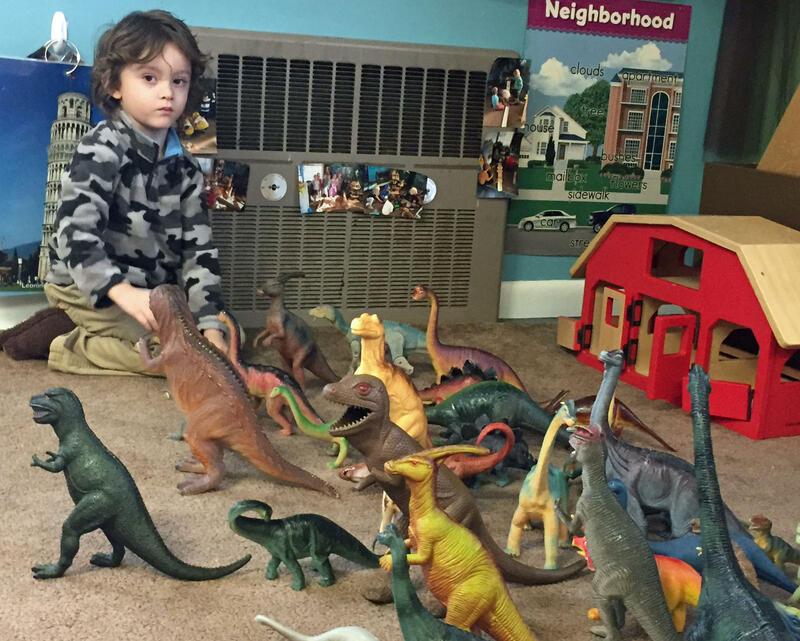 Romeo Gutierrez commands a herd of dinosaurs in the Wee Explorers classroom. Beck says the process is easy. First, families sign up for Universal Pre-K at their local elementary school, then they sign up with the preschool of their choice. "And everything after that point, after that paperwork is filled, is all taken care of," says Beck. "We have contracts with each elementary school and our bookkeeper simply sends out an invoice every month and we get the payment directly made out to us, so parents don’t have to do anything after that." Beck says Vermont’s Universal Pre-K law has had a stabilizing effect on the Wee Explorers program. "Prior to that," she says, "parents used to pay a monthly tuition fee and we also had to fundraise to make ends meet. And since we’re a half-day part-week program, most of our families had one parent that stayed at home. So our enrollment was adequate, but some years we struggled a lot more than others." And now that Wee Explorers is run with public tuition dollars, Beck says more families can afford to take advantage of the preschool. And that’s brought more diversity into the classroom. "And our enrollment numbers have gone up and we have a wait list," she adds, "so it’s really a win-win for everyone." 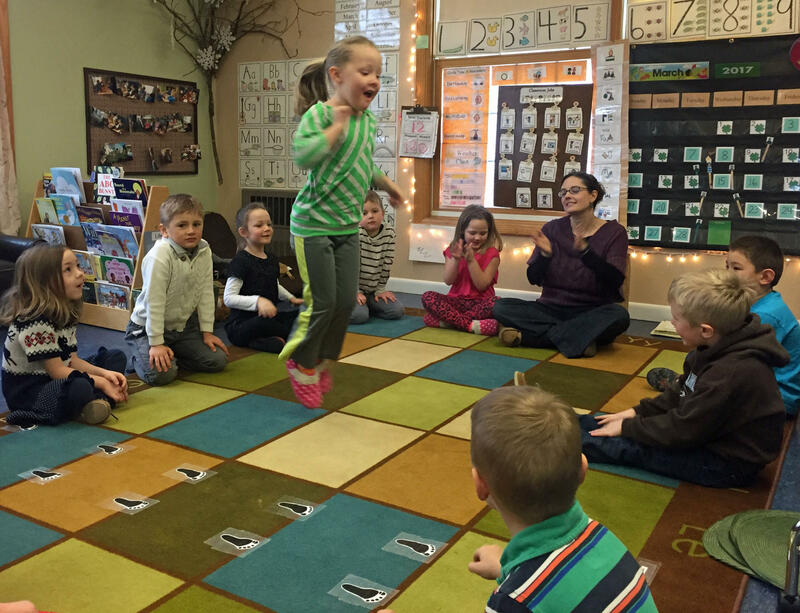 Harper Wells takes a turn jumping inside the morning meeting circle. Anne Demars is a first grade teacher in Morrisville. More than a decade ago, she ran Wee Explorers. "When I was a preschool teacher, there weren’t many preschool programs," Demars says. "And I found that as a deficit for the children in our area, because it just opens up so many windows of opportunity for kids and school readiness going into kindergarten." With Universal Pre-K, Demars says by the time students enter her first grade classroom, they're better equipped to learn. "They're much more adapted to a setting that they've been exposed to before," she says. "So, we're noticing less separation anxiety. We're noticing what we're calling scholarly habits – a little bit more independence, some self-confidence, a little bit more ability to be persevering." And the Agency of Education says an increasing number of students are laying down that foundation in preschool. The state estimates there are about 15,000 children in Vermont eligible for the Universal Pre-K program, and about half of them are now attending preschool. This week’s winter storm came at the perfect time for a group that has been skiing and riding in mid-March at Stowe Mountain Resort for over a quarter-century. This week is the annual winter summit for insurance giant AIG and some special guests. On Town Meeting Day, four central Vermont communities allocated money to build a recreational bridge over the Winooski River. It's a project of the Cross Vermont Trail Association, which has been working to create a recreational trail network across central Vermont since the early 1990s.